Place pork tenderloin in glass bowl; add 1 cup of the beer. Cover; refrigerate 1 hour. Meanwhile, in small bowl, mix remaining 1/2 cup beer and the Wheat Beer Vinaigrette ingredients. Refrigerate until ready to serve. Heat oven to 350°F. Place pork in shallow pan. Bake 40 to 50 minutes or until pork has slight blush of pink in center and meat thermometer inserted in center reads 160°F. Cool; shred pork using two forks. In large serving bowl, mix greens, corn, dates and almonds. Pour about 1/2 cup of the vinaigrette over salad; toss to coat. Top with shredded pork, avocado slices and poblano chile. Serve salad with remaining vinaigrette. 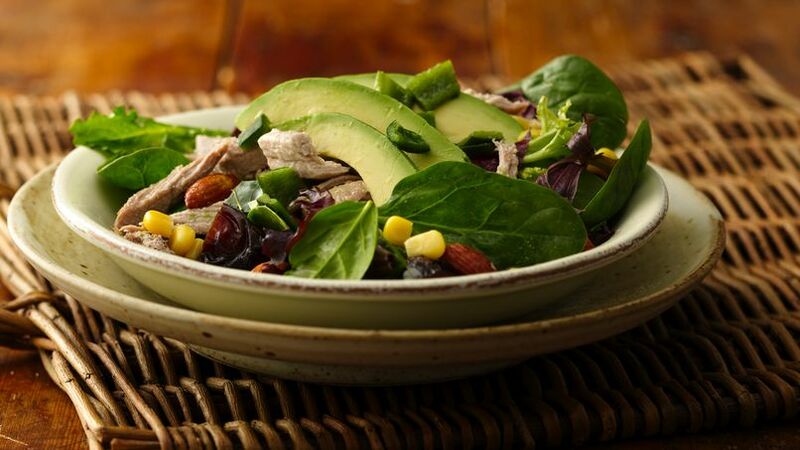 Enjoy this pork salad that’s made using mixed greens, avocados and corn – a tasty dinner.